Replacement Fuse, 1-A Slow Blow for use with door solenoid. 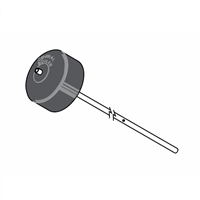 Replacement Fuse, 3-A for Maxim, Classic and E-Classic furnaces (excludes Dual Fuel models-use 5-A). Various Fuses and Fuse Holder protect solenoid from overload. Replacement Fuse, 5-A for Dual Fuel Classic furnaces. Various Fuses and Fuse Holder protect solenoid from overload. Price per foot for door seal rope, 7/8". Silicone is not included. Replacement Fuse, 10-A, 250V, Lead Free for Pallet Burner furnace. Replacement sight gauge tube only (Per Foot, 9/16" OD x 3/8" ID). Classic Edge 350, 550 & 750 models use 6" length. E-Classic 1450, 3200 & 3250 models use 6" length. E-Classic 1400, 2300 & 2400 models use 7" length. Forge 1500 & 3500 models use 9" length. Classic 4030, 5036, 6048 & 7260 models use 9" length. Pallet Burner models use 14" length. Components replace original components. Price per foot for door seal rope, 1". Silicone is not included. Replacement Light Bulb (40 W) for furnaces. Linkage between the solenoid and damper control. Comes complete with cotter pins. Linkage, Wire Loop Models. Linkage between the solenoid and damper control. Comes complete with cotter pins. Linkage, All Linkage Models. Sight Gauge Components, Elbow, 1/4"
Sight Gauge Components replace original components. Elbow only (1/4"). Temperature Sensor Well for Classic model outdoor furnaces with a Digital Temperature Controller. Replacement draft door lid for side draft on Classic CL 17 models with cast door. Replacement draft door lid for steel doors on Classic CL 17 & CL 40 models that do not have a side draft. Replaces door handle shouldered bolt on CL 4030 or CL 5036 milled cast firebox door with a bushing and bolt with longer threads. Replacement Rocker Switches for furnaces. Rocker Switch, Power Supply (on-off). High Limit Switch opens on temperature rise. Replacement draft door lid for side draft on Classic CL 40 models with cast door. Replacement Vent Cap for Classic and E-Classic outdoor furnaces helps prevent water loss through the vent pipe. Replacement snap action Door Switch for Pallet Burner furnaces. Replacement Vent Cap helps prevent water loss through the vent pipe and indicates water level. For M175 models only. Pre-cut, 8 foot length for CL 4030 or CL 5036, door seal rope, 7/8". Silicone is not included.